We are happy to announce that Gil has written a new book! 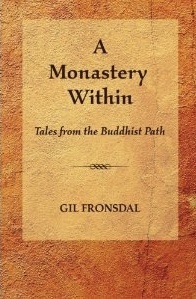 Inspired by his years of Buddhist monastic life, Gil Fronsdal has written these warm-hearted stories as part of the tradition of teaching through storytelling. These are tales of transformation and spiritual growth. They delight and challenge as they express different facets of the Buddhist path to liberation in familiar, yet fresh and engaging, ways. These stories can be reread often, each time supporting new reflections on the spiritual life and the possibility of each person awakening to the kindness, clarity and insight available to all of us. A Monastery Within points to how each person can build an inner home for the awakened life. The book is now available to purchase through Amazon in paperback or Kindle, or through the iBookstore for iPad and iPhone. Gil Fronsdal is the primary teacher for the Insight Meditation Center in Redwood City, California. He has been teaching since 1990 and has practiced Zen and Vipassana in the U.S. and Asia since 1975. He was a Theravada monk in Burma and trained with Jack Kornfield to be a Vipassana teacher. He was also ordained as a Soto Zen priest at the San Francisco Zen Center and received Dharma Transmission from Mel Weitsman. Gil has a PhD in Relgious Studies from Stanford University. Gil’s teachings can be found on Audiodharma and on the Insight Meditation Center website. His translation of the Dhammapada, an important collection of Buddhist verses, is published by Shambhala Publications. He is the author of “The Issue at Hand: Essays on Buddhist Mindfulness Practice.” He is a husband and a father of two sons.